Colorful Circus | Carnival Party Ideas – Sammy’s 5th Birthday Party! Step right up, the Circus is in town! With bright colors and plenty of fun, this party has oodles of amazing big top Circus or Carnival Party Ideas for you! 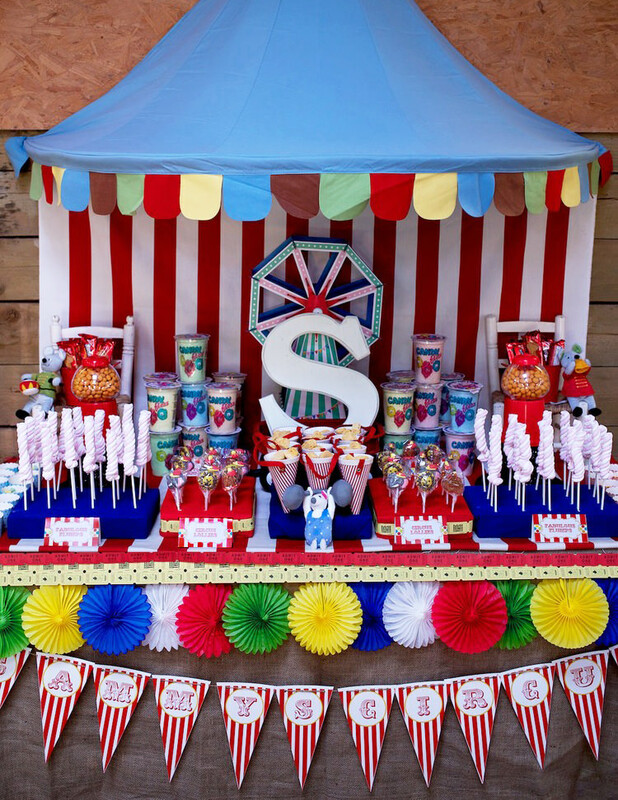 Sammy’s 5th Circus Birthday Party was styled by his mum Lucy from Capture By Lucy. Lucy has incorporated my Circus or Carnival Party Printables to tie-in the party theme along with plenty of her own creativity. Lucy has cleverly used an inexpensive Big Top Bed Canopy from Ikea above some red-striped fabric as the backdrop to her Circus party table. I love this Ikea hack! See more party table styling tips on Lucy’s blog post How To Style The Perfect Party Table! You can see above Lucy has customized my printable banner with ‘Sammys Circus’ and run it along the bottom of the party table. You can customize the banner to use whatever wording you wish for your own party. My Circus or Carnival printable party signs are very versatile and have helped Lucy set her party scene as “The Greatest Show on Earth”! My Snack box template has been used here to hold popcorn and the Thank You tags have been used to send home some fishy Circus party favors! 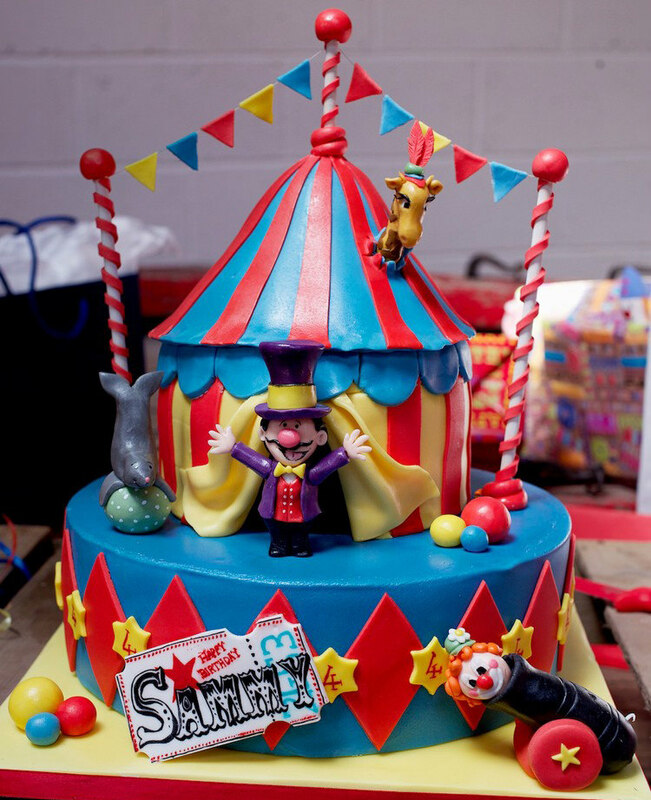 Check out the details on Sammy’s Circus Birthday Cake. Lucy believes the cake needs to be displayed proudly throughout the party and I certainly agree. Particularly when it looks like this! Lucy’s Circus or Carnival Party Food Ideas, such as ‘Monkey Nuts’, ‘Fabulous Flumps’, ‘Circus Lollies’ and ‘Cotton Candy are amazingly easy but will look great on your party table. Lucy has customized my printable food labels to make the gorgeous food stand out. These food labels can be edited and printed out for as many food items that you have. If you need some pointers on party food, see Lucy’s guide on How to Make the Perfect Party Tea. Her Circus Cupcakes are to die for too! Grown ups weren’t forgotten at Sammy’s Circus Party. Lucy has a table of Grown Ups drinks decorated with balloons, colorful glasses and bunting. To keep the younger party guests entertained, Lucy set up a Traditional Circus Fair with a DIY tattoo parlor and coloring-in area. Signs from my Circus or Carnival Party Printables decorate the separate areas. For a fun twist on a traditional Kissing Booth, Lucy used a cardboard market stall stand from Ikea and asked the kids to guess the number of Hershey’s Chocolate Kisses in the jar! To recreate this at your party, simply insert one of my party signs in the front panel of the stand and print off Kissing Booth Answer Cards from my Circus or Carnival Party Printables! Red Clown noses were out for anyone wanting to do some clowning around. So if your kids are ready to run away and join the circus, I hope that Sammy’s 5th Birthday party has given you plenty of Circus or Carnival Party ideas! Many thanks to Capture By Lucy for sharing her gorgeous party! Don’t forget that my Circus or Carnival Party Printables can help you create a simply stunning Circus or Carnival Party. Available in 4 different colorways. All the party printables are instant downloads and can be customized and printed by you at home. How easy is that? !